PandaTip: This template assumes that the WordPress developer is part of a company or consultancy. If you are a self-employed freelancer or consultant, you can replace all of the instances of [COMPANY] with your own name. Every business needs an effective web presence, whether purely virtual or a brick-and-mortar store. [COMPANY.Company] has successfully helped design and implement web sites and web applications for clients for over [NUMBER YEARS] years. [COMPANY.Company] proposes to provide [CLIENT.Company] with a full package of website design, configuration, training and maintenance services. PandaTip: Include pictures and information about the specific developers, designers, and project managers that will be working with this client. Testimonials and before-and-after collateral from previous clients are great as well. [COMPANY.Company] is a privately held company, consisting of a creative and multi-talented team comprised of web designers, web developers and graphic designers. We provide a wide range of services including web design, web development, mobile application development, web hosting, and consulting. [COMPANY.Company] offers customer-oriented services and delivers creative and effective results. For the initial phase of development (the online presence), [COMPANY.Company] will work with the client to create website design concepts and migrate content for [WEBSITE]. This initial phase will last 3 months. PandaTip: Depending on the client and the length/scope of the project, they may want a more detailed schedule of deliverables and releases. [COMPANY.Company] will install a content management solution to allow [CLIENT.Company] to easily update the website as needed. All necessary extensions for the content management system which are not open-source will be purchased by [COMPANY.Company]. 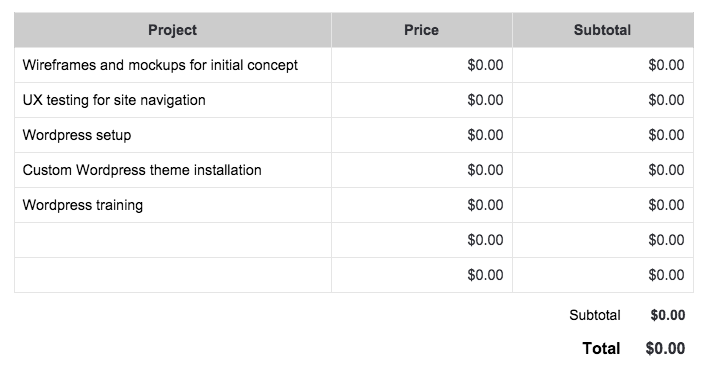 Client shall pay [COMPANY.Company] 50% upon invoice receipt and 50% after project completion. Project is scheduled to be completed within 3 months from initiation payment date. Payment terms are net fifteen (15) days from the date of invoice initiation or project completion date. Any amounts not paid within the thirty (30) days shall be charged an interest fee of 1-1/2% for each month (or portion thereof) any such payment is late.